How Fast are def cdef cpdef? Pure Python (using a list of values). python3 -m timeit -s "import StdDev; import numpy as np; a = [float(v) for v in range(1000000)]" "StdDev.pyStdDev(a)"
python3 -m timeit -s "import StdDev; import numpy as np; a = np.arange(1e6)" "StdDev.npStdDev(a)"
python3 -m timeit -s "import cyStdDev; import numpy as np; a = np.arange(1e6)" "cyStdDev.cyStdDev(a)"
python3 -m timeit -s "import cyStdDev; import numpy as np; a = np.arange(1e6)" "cyStdDev.cyOptStdDev(a)"
python3 -m timeit -s "import cyStdDev; import numpy as np; a = np.arange(1e6)" "cyStdDev.cStdDev(a)"
Numpy is around 30x faster than pure Python in this case. 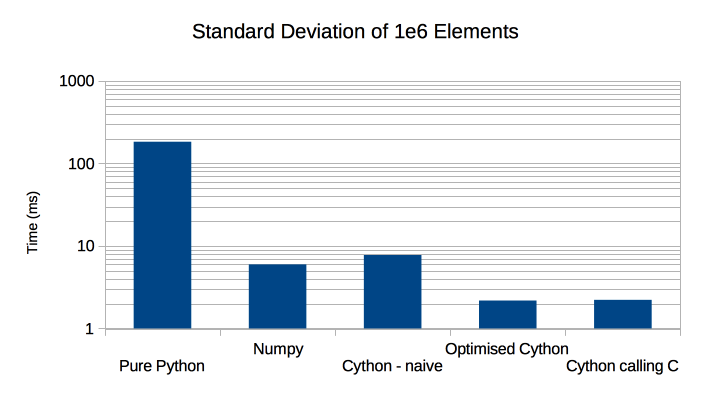 Surprisingly Numpy was not the fastest, even naive Cython can get close to its performance . Optimised Cython performs as well as pure ‘C’ but the Cython code is rather opaque. At PyconUK 2014 Ian Ozsvald and I may have found why numpy is comparatively slow. Watch this space! © Copyright 2014, Paul Ross. Revision b6f687e4.